Ever experienced stroller envy? Ever wished you were applauded just for walking across a room? Ever wanted to loaf about the park on a blanket in the middle of a school day with nothing on your agenda but being relaxed and happy? Then you should be a baby. They’ve got it made. 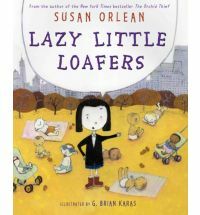 In this charming, droll story, a world-weary older sister ponders the question, why don’t more babies work? Her answers, hilariously tinged with resentment, offer up a wickedly accurate picture of just how great babies have it.